When Chester face Stalybridge Celtic at Witton on April 17th it will be the first time they have featured in the Final of the Cheshire Senior Cup since 1932. For many years the competition has been regarded as an inconvenience but interest seems to have gathered this year as the Blues have moved closer to the Final and there should be a good turnout at Wincham Park in three weeks time. The declining interest was no doubt due to the fact that once Chester were elected to the Football League in 1931 it essentially became a competition for the reserve team. When the club dropped out of the Cheshire County League in 1969 it seemed to further loosen the bonds and it became even more of an irritant over the next 30 years. The only time I can remember it being taken vaguely seriously was in 1998 when Kevin Ratcliffe played the first team in a Second Round tie against Altrincham. Two days earlier the Blues had been whipped 6-0 by Cardiff City in the FA Cup and Ratcliffe fielded the same team with the exception of Wayne Brown who was replaced in goal by Neil Cutler. This attempt to regain confidence backfired badly as the Robins won 3-0 with former Blue, Leroy Chambers scoring the first goal. Even when City were relegated from the Conference in 2000 they continued to play a mixture of reserves and youngsters resulting in an inevitable, and probably welcomed, early exit. All this contrasts with the early years of the cup, which was first contested in 1879/80. Northwich Victoria won the cup every year for the initial six seasons and Chester’s first match in the competition took place in December 1885 when they lost 3-1 at Middlewich. Before the end of the century Chester had featured in five finals winning it for the first time in 1895 and following up with another triumph two years later. They continued to figure prominently until the First World War with victories in 1904, 1908 and 1909. There was a 22 year break until the next success when Charlie Hewitt’s all-star team hammered Crewe Alexandra 6-1 in the Final at Northwich. Salford school teacher Arthur Gale enhanced his goalscoring reputation with four of the goals in the Final to take his total in the competition to 17 goals in five games. By the following season Chester had taken up their place in the Football League and it was left to the reserves, still competing in the Cheshire County League, to defend the cup. The tie against Sandbach Ramblers was originally scheduled as an away match but in order to help out the financially crippled opponents the game was switched to Sealand Road and brought forward to Boxing Day. Sandbach were duly rewarded with a bumper holiday crowd of 3,549 on a day that the first team played at Lincoln City. In a keenly contested game Chester were much the better team and won more easily than the 3-2 scoreline suggests although they had to recover from 2-1 down to progress. The match was a personal triumph for Penk who scored all three goals. That he played at all was a surprise as he was a last minute replacement for Albert Valentine who had been called up for the first team duty at Lincoln. The team contained six players who had featured in Division Three North action with the aforementioned Penk along with Harris, Capner, Ward and G Jones destined never to make the first team. Captain of the team was Josh Atkinson, the former Leeds and Barnsley defender who had led Chester to the championship the previous season. Chester – Burke, Carr, W Jones, Keeley, Millsom, Evans, Atkinson, Penk, Harris, Valentine, C Matthews. Planters were a works team from Bromborough and despite their lowly status they played above themselves to earn a replay at Sealand Road. On a soft and heavy pitch Chester failed to impress and although Planters lacked the all-round ability of the visitors they showed great courage and tactical sense to twice come from behind. The Chester goals came from the returning Valentine and Harris but man of the match was Ernie Millsom, a former Charlton Athletic defender, who had been in and out of the first team in previous weeks. The game proved to be one of the last Chester games for Ernie Keeley. The Ellesmere Port defender had moved to Sealand Road from his home town club but some impressive first team performances led to a transfer to Leicester City with the money raised going to finance ground improvements. On a bitterly cold Wednesday afternoon there were no more than 400 present to see Chester progress to the Third Round. With no first team game scheduled the side was strengthened by the presence of left winger Foster Hedley as well as centre half Billy Matthews and Cud Robson who had both recently played in the Division Three side. The experienced Matthews was a former Bristol City, Wrexham and Bradford Park Avenue player who had also earned international caps for Wales. In a scrappy game Chester again failed to impress despite the 4-1 victory while Planters put up a good performance but were let down by their finishing . The goalscorers were Valentine and Spencer Evans with two apiece and in the days before substitutes Chester played the second half with 10 men after Robson was taken ill. In front of a “promising” crowd Chester overcame their Cheshire County League rivals with a goal in each half from Flintshire based Catherall and winger Archie Ferguson. Although Chester were worthy winners on a sunny afternoon they could not repeat their goalscoring exploits of the previous week when they had defeated Whitchurch 7-3 with Valentine scoring six of the goals. With the first team playing at Sealand Road against Tranmere Rovers there were very few Chester fans present to see the reserves put up one of their best performances of the season. Stockport had been firm favourites to win the tie, as they were without a Third Division match that day, and as a result it had been expected that they would field a formidable team. In the event County fielded many of their first team players in a Central League fixture but were still able to select a strong team. Meanwhile Chester, with Mr George Russell (one of the directors) and Mr Harrison in charge of the team, had not been able to select new signings John Ranson and Allan Livingstone who were ineleigible after signing from financially troubled Colwyn Bay. In a keenly contested game, that threatened to get out of hand at times, all the goals were scored in the second half. The turning point came when the tenacious Valentine scored with a goal out of nothing. Picking the ball up in the Stockport half he shook off the challenge of three defenders and put the ball past Finney in the County goal. Spencer Evans then added a second prompting County to stage an onslaught on the Chester goal. Smith pulled a goal back with 20 minutes to go but the defence held firm despite several near misses. With a minute to go Finney went out of his goal to retrieve the ball but lost possession to Valentine who placed the ball into an empty net. It had been an outstanding team performance and Chester had been indebted to the finishing power of Valentine although special mention was also made of full backs Harris and Carr. Harris, who had often been criticised for his robust tackling, had the game of his life aided by the more experienced Carr. In the other semi-final Crewe Alexandra beat Hyde United at Macclesfield to set up a repeat of the previous year’s Final. The Final was scheduled for a week after the end of the Division Three North season and both teams showed there determination to capture the handsome trophy by fielding their first elevens. Showing a complete lack of sentiment, the players who had done so much to take the club to the Final were cast aside and to add insult to injury the retained list had already been announced and the squad were already aware of their future at the club. Atkinson, Spencer Evans and Harris had all been made open to transfer while the likes of Carr, Billy Matthews, Ernie Millsom and Archie Ferguson had been given free transfers. Perhaps unluckiest of all was centre-forward Albert Valentine who went on to sign for Crewe but made a name for himself with Halifax in the mid-1930s where he scored 89 goals in 114 games. Cyril Matthews was the only player to feature in the Final having played in an earlier round and he had also been placed on the transfer list. In an enjoyable game, that fluctuated from end to end, Chester were the better team and the game was settled by a single Matt Robinson goal in the 7th minute. The former Manchester United winger, who went on to have a long career at Barrow, scored with a first time shot after a right wing cross by Matthews. 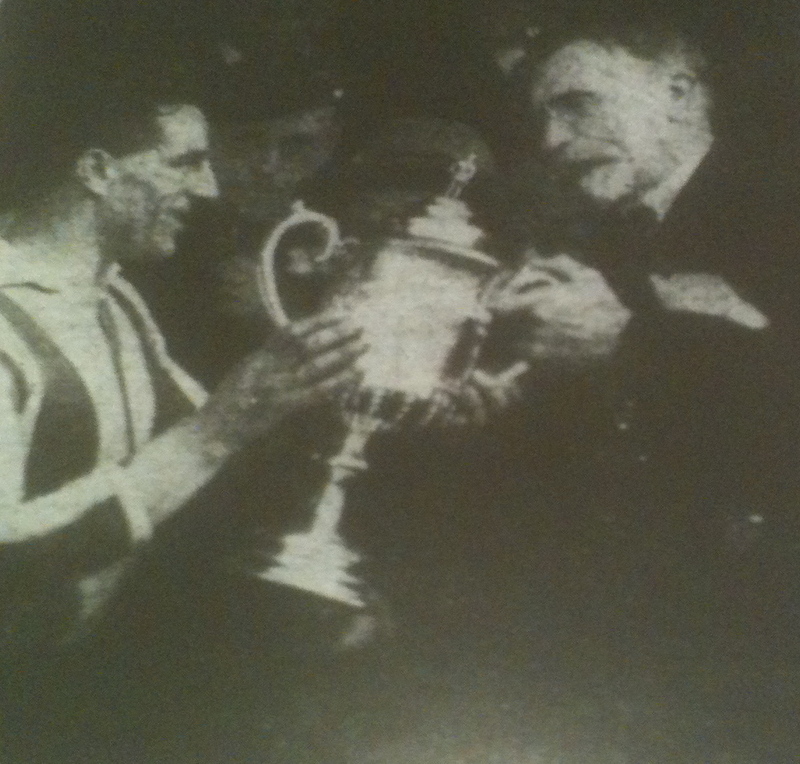 The cup was presented to captain Tommy Jennings by the President of the Cheshire FA, Edward Case, who himself had been a Chester supporter for more than 30 years. When the team returned to the city they were greeted by hundreds of supporters at the town hall and speeches were made on the steps by Jennings, vice-captain Harry Skitt, chairman Harry Mansley, the Mayor and Edward Case. had been to the assembled throngs by and the celebrations adjourned in the Nag’s Head. Chester were not given the opportunity to defend the trophy in 1933 as a resolution had been proposed by Northwich Victoria to exclude Football League clubs from the competition. This had reluctantly been passed at a meeting of the Cheshire FA at the Blossoms Hotel four days after the Final. This exclusion did not last long and although Chester returned to the competition they never reached the final again. After an 81 year gap I’m looking forward to see Chester compete for a trophy that proved so important in the early years of the club. This entry was posted in Matches and tagged Cheshire Senior Cup, Chester, Congleton, Crewe, Northwich Victoria, Planters, Sandbach, Stalybridge Celtic, Stockport, Witton Albion by kwchas. Bookmark the permalink. Thankyou for your superb history on the CSC.